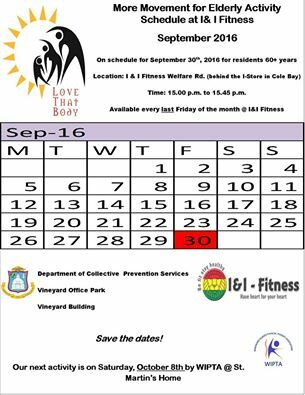 More Movement for the Elderly, will continue on Friday, September 30. Persons 60+ are invited to I & I Fitness Center from 3.00PM to 3.45PM for the fitness workout. I & I Fitness Center are located on Welfare road, Cole Bay just behind the I-Store. Every last Friday of the month, senior citizens can go to I & I Fitness for a fitness workout. More Movement for the Elderly Fitness is about getting fit and staying fit as you grow older. You are never too old to start exercising. No matter your age or your current physical condition, you can benefit from exercise. Exercise doesn’t have to involve strenuous workouts at the gym as there are many easy ways to get your body moving which will improve your health. As a person ages, regular exercise is more important than ever. A Swedish study found that exercise was the number one contributor to longevity, adding extra years to your life, even if you start exercising in your senior years. More Movement for the Elderly Fitness has been organized and coordinated by the Collective Prevention Services (CPS), a department from the Sint Maarten Ministry of Public Health, Social Development and Labour, the White and Yellow Cross Foundation (WYCCF), Windward Islands Physical Therapist Association (WIPTA) and I&I Fitness. The exercise activities have been spread over a one-year period with three activities planned every month at different venues.